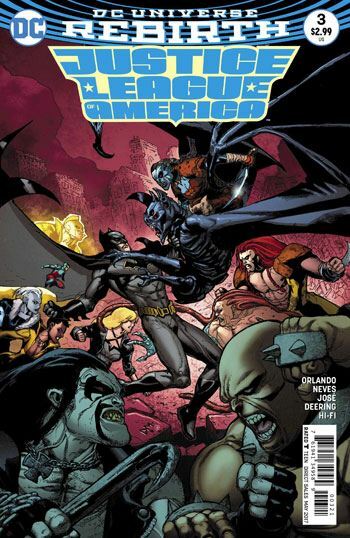 Tag "justice league of america"
The Justice League confront the Extremists in the third issue of their new book. Orlando takes a lot of care to get the politics right in this story. This is not a case of an American super team barging in, disregarding borders and laws to impose their form of justice on an independent nation. I quite admire that he takes the time in this story to make sure the team acts in a way that sees them aid the Kravians, rather than just using them as cannon fodder. Batman may be the leader of the team, but Black Canary seems to be edging her way into that position. She has already shown herself confident enough to stand up to Batman, question his decisions and order him around, and in this issue she displays diplomacy and a willingness to listen, which also make her more suited to the leadership role. I suspect that Orlando is intentionally building in this direction. 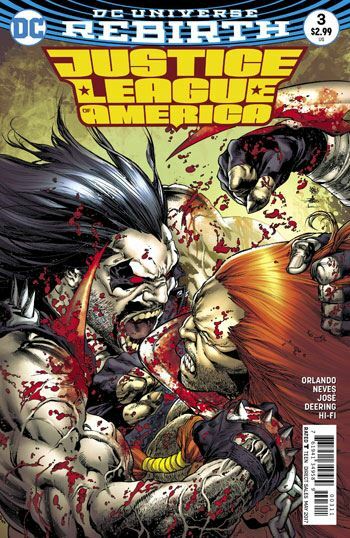 Aside from that, most of the issue consists of setting up the Leaguers against members of the Extremists, for fight scenes to play out in the next issue. I am fine with that. It builds the expectation, and it all looks great. A friend of mine pointed out that Gorgon’s tentacles now seem to be hair extensions, rather than the more Doc Oc-type arms emerging from his head in earlier incarnations of this team. Lord Havok is busy as well, also playing some clever politics to make things more difficult for the League. Interestingly, a fairly accurate map of Central Europe is used in the issue. It’s not quite right, keeping Kravia a fictional nation, but the use of other fictional countries in the issue, some old and some new, makes me wonder if Poland, for example, actually exists in the DC Universe. The scene between the Ray and Dreamslayer is also quite interesting. I have always found Dreamslayer the most interesting of the Extremists, and this incarnation carries that on. His motivations do not precisely line up with those of Lord Havok, but will that make Dreamslayer an asset to the League, or a greater danger to come?